Cody, Roman, Hailey, family and friends, We are so sorry for your loss our deepest sympathy and condolences. It was always a pleasure to talk to, see and help Mikki. Your mom was the only one allowed to call Isabelle "Ginger". She loved having her teach her karate. What an inspiration and an encouragement she was to Monica in her own journey with cancer. Thank you for sharing your mom with all of us. Mikki really was proud of her family, friends and community. Our prayers and thoughts are with you. RIP my friend. I admired your strength, courage & enjoyed your friendship. Until we meet again. Prayers for your family, friends & students. My condolences to the family, friends, and students of Mikki. She was a wonderful person who touched the lives of many. You have my deepest sympathies for your loss. Prayers and hugs to your family Mikki. My sweet warrior friend. I love you and will miss seeing your beautiful smile. Thank you for making my life brighter. You touched so many lives and an inspiration to all that knew you. Your beautiful smile will live in the hearts of all forever. God Bless, our thoughts and prayers are with Roman,Cody,Hailey and family. I will miss you Mikki. Sorry for your loss Roman, Cody and Hailey.She is an angel. Our thoughts and prayers go out to the families and friends of Mikki Bort. Mikki will be missed by so many because she touch our heart deeply. Fly with the angels and be at peace. Prayers going out to the family and community. RIP my sweet BEAUTIFUL friend. You touched our lives in ways you will never know. Love you always!! Oh Mikki...you took my boys under your wing at the hardest time of their life and they spent years at your dojo learning to become little men. They gained confidence and strength because of people like you. You meant a lot to many and will be greatly missed. May you have peace now. And may your family find some comfort in the stories of what a life you had and how many you touched. Thoughts and Prayers to family and friends. She taught so many people so much. RIP Mikki. What a courageous young lady, full of fight, fly high beautiful. Mikki always had a smile for everyone. She touched so many lives. We are so blessed to have known such an amazing guiding light who loved with her whole heart. My thoughts and prayers are with her family and all those who loved Mikki. RIP Mikki, I was truly blessed to have you in my life. Fly with the angels sweet cousin, your fight here on earth is done. Your memory will live on to inspire others just like you did. You were a true inspiration to all who knew you, a heart of gold and strength of a warrior. You made everyone that crossed your path feel like a friend, you will be sadly missed by all. There are no words to describe what an incredible woman you were. Your memory will live on in everyone you touched. Sending love and prayers to your family. We all have wonderful memories from her karate tournaments. She was a wonderful inspiration to all. Rest in peace, Mikki. Mikki is truly an inspiration to everyone who met her. She will be missed deeply. My life was touched in many ways by Mikki. She will be missed but certainly left a remarkable statement of faith and trust in God to many. My sympathies to the family. An amazing and beautiful lady who had the heart of a lion and the soul of an angel. Prayers going out to the family and community. Mikki, your soul will live on in so many  that you’ve touched in your short lived years on earth. Your were an inspritation to so many, never to be forgotten. Condolences and sympthany to your family you loved so much. RIP in God’s Love.and Glory. R.I.P. Mikki, you fought a long fight but have helped so many and will never be forgotten. Thank you for teaching me. Prayers to the family. WILL ALWAYS REMEMBER THE SMILES, ACTS OF KINDNESS THAT YOU GAVE TO ALL OF US. YOU STILL GAVE WITH YOUR KINDRED SOUL WHILE FIGHTING A LONG BATTLE. LET GOD TAKE CARE OF YOU NOW, LET GOD GIVE YOUR FAMILY THE TIME & COMFORT THEY NEED TO FEEL AT PEACE, YOU RAISED BEAUTIFUL CHILDREN. OUR PRAYERS WILL BE WITH YOU, THE FAMILY & FRIENDS. May you rest in peace. Prayers to all your family and friends. You felt a long battle and you were a wonderful lady. So sorry for your loss. 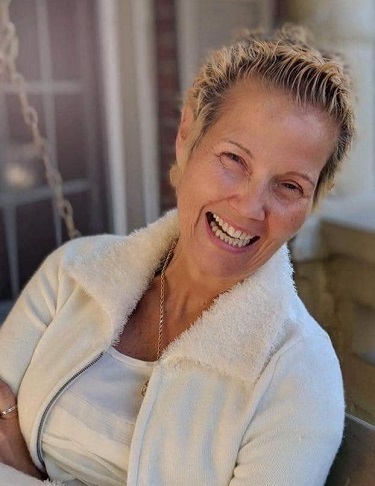 Mikki will always be special to my family we hardly knew her and she volunteered at my husbands benfit and touch so many her smile would light up a room. Rest In peace Mikki.. You are truly the sweetest caring person and inspired many and is loved by many. Prayers to your family and friends. I will always remember the first day I met you when you came to my house years ago. Rest In Peace Mikki! Truly a great warrior! My thought, and prayers are with Roman, Cody, Hailey, and family. She love you all so much! I am so sorry for your loss. Click here to see all the candles that have been lit for Mikki Deanne Bort.